Inappropriate plant selection. Spend your money wisely and choose plants that are appropriate for the site. Check their requirement for sun or shade and their mature height and width. A plant that requires full sun will not bloom well in the shade. Conversely, a plant that needs partial or full shade will fry in our summer sun. Pruning to keep a plant the desired size is a life-time commitment and is harmful to the plant. Sometimes, a dwarf cultivar is available. Improper planting. Don’t starve your plants for water and oxygen! The hole you dig shouldn’t be too deep – the plant’s root crown (where the stem/trunk meets the root) should be slightly above ground level for shrubs and trees. Annuals and perennials should be planted at the same depth they were in the pot. Adding organic material, such as compost, to the soil you remove and use as backfill will improve the texture of the soil and provide nutrients. Too much mulch. No “volcanoes” around trees or shrubs! Mulching your plants and flower beds conserves soil moisture and moderates soil temperatures (important during our hot summers). However, it shouldn’t be so deep that it smothers plant roots. Three inches is typically adequate, keeping it three-six inches from stems/trunks. Organic mulches, such as pine straw, shredded wood or bark nuggets enrich the soil as they break down and provide nutrients for plants. Unhelpful irrigation. Don’t waste precious water! Established plants and lawns need only one inch of water per week either through rainfall or irrigation. Irrigate less frequently but for longer periods of time to encourage deeper root development. To discourage disease, water in the morning so that lawns and plants have ample to dry before sunset. Improper fertilizing. A soil test is helpful in developing a fertilization program. For .00, Clemson’s Agricultural Lab will analyze the soil and provide a detailed report that includes specific fertilizer recommendations. If the soil’s pH is not in the correct range, no amount of fertilizer will help an ailing plant. Samples can be delivered to the Clemson Extension Office in Beaufort. Always follow label instructions for the time of year and amount of fertilizer to apply. Poor pruning practices. 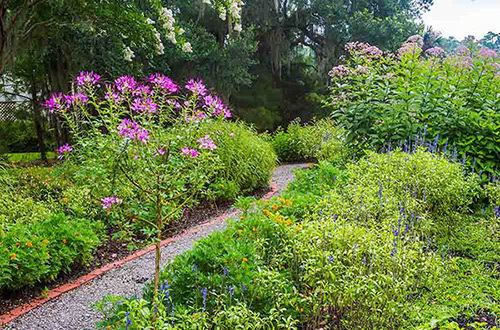 Don’t “murder” crape myrtles – and what about those meatball-shaped shrubs! Repeated shearing of a shrub results in an unsightly and unhealthy plant. Clemson’s Home and Garden Information Center (HGIC) website, http://www.clemson.edu/extension/hgic/complete_list.html, has fact sheets on proper pruning techniques and the correct time to prune your shrubs. It’s also a great resource for all your gardening questions. Not reading the label before using any chemical or pesticide. More is not better! Follow the manufacturer’s instructions on the proper application of chemicals/pesticides to avoid run-off into our streams and rivers. Not gardening. Gardening is good for the body and mind. It has been proven to reduce stress, lower blood pressure, lower cholesterol and reduce depression. In addition, the pleasure one gets from each season’s blossoms is priceless.